Our range of products include geopathic stress neutralizer rod. 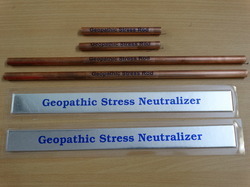 Geopathic Stress Neutralizer Rod made by us are the Most Powerful Gadgets available in the World to Neutralize the Geopathic Stress Lines Immediately, Effectively and Permanently at Most Economical Cost. It is packed with Most Effective MINERAL Combination and impregnated with 7.83 Hz Frequency to effectively Neutralize the Dangerous Geopathic Stress Lines Permanently. It is used currently in more than 25 countries of the World. There are 5 types of Geopathic Stress Neutralizers available with us. Looking for Geopathic Stress Neutralizer Rod ?